We believe clear, open communication with you is essential at all times during the servicing of your car, giving you peace of mind and reliable, safe motoring. 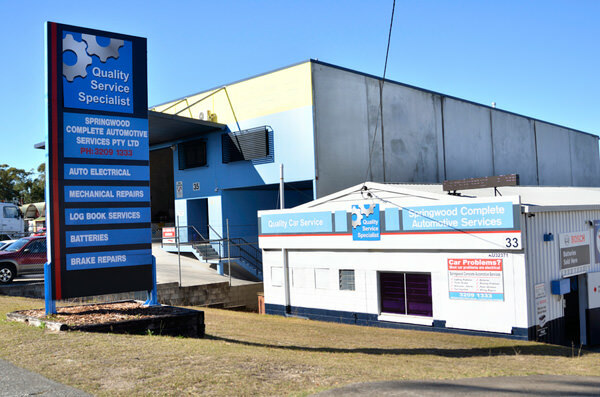 When it comes to high quality, in-expensive car servicing and mechanical repairs on all makes and models look no further than Springwood Complete Automotive Services, servicing Springwood, Underwood, Slacks Creek and surrounding areas of South Brisbane. Look for the blue “Quality Service Specialist” sign! I really appreciate your help when I needed it most, (I nearly overheated my engine) Thank you very much! Hi, many thanks for making us feel so welcome! After many years of having our cars serviced by our personal friend Ray (until his retirement), we didn’t know what to expect and we were very pleased with the service you provided. Hi, I feel I can trust the work that you do. I will be telling my friends about a great Brisbane mechanic I have found. I think it’s fantastic, great customer service and the people there were enthusiastic and helpful. Hi, many thanks for being very honest and reliable. It was fantastic to find business that treats its female customers with respect. I will be telling all the mum’s at the school gate. Thank you. Great Personal Service. Keep up the good work. You guys are Legendary! !